Creepy horror is the theme on offer in Dark Vortex, a 5 reel, 243 ways to win video slot. Created by Yggdrasil Gaming, it comes with some unusual extras. Open up all of the Vortex Reels and you’ll increase the number of ways to win to 3,125 as well as adding stacks of extra wilds and up to 20 free spins. Play on your PC, tablet or mobile from between 10p and £50 per spin. Yggdrasil Gaming titles are usually pretty good to look at and that’s the case with Dark Vortex. The reels feature stone skulls, skeletons and candles. You’ll see 10 standard symbols spinning around the reels. Joining the 5 lower value book of spells symbols are 5 higher values grotesques. The best of these is red devil creature which pays 6 times your bet if you land 5 on adjacent reels. Look out for the Vortex symbol. Land 2 or more of these next to each other and you’ll open up the Vortex Reels feature – these are 5 rather than 3 symbols high which increases the number of ways to win. You’ll also see stacked wilds and stacked high value symbols when the Vortex Reels are open. Each additional Vortex symbol adds another 2 Vortex Spins to your total as well as bringing another Vortex Reel into play. Also, in play when the Vortex Reels are open are the blue and pink orbs. Pink orbs increase the number of wilds in play during the free spins. You’ll automatically receive 2 but can add more when these symbols hit on reels 1 and 5. The blue orb can hit on the middle 3 reels. These add to the number of free spins awarded when you trigger the free spins round. This is called the Orb Collection feature. That free spins round, the Vortex Free Spins feature, is activated when you open up all 5 Vortex Reels. These are played out on the 3,125 ways to win machine. Every pink orb collected increases the length of the wild stacks in reels 1, 2 and 3. The accumulated blue orbs determine the number of free spins awarded. You can also pay 80 times your bet to guarantee entry to the Vortex Free Spins feature – pick cards to reveal the number of free spins on offer and how high the wild stacks will be. You could get between 5 and 20 free spins with stacked wilds 2 to 10 symbols high. 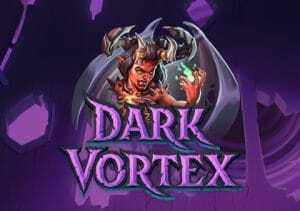 Dark Vortex has the look of a typical Yggdrasil Gaming video slot. The gameplay is quite different from what you’ll usually find though and takes a little getting used to. We’d certainly recommend a few spins in demo mode until you get used to the Vortex Reels and their associated extras. Once you’ve got your eye in, there’s plenty to like here. The creepy design is well done and the features offer something unusual. If you’re a horror lover, then Dark Vortex is worth a closer look. More importantly, you can win a huge 7,318 times your bet on every Vortex Spin/free spin!